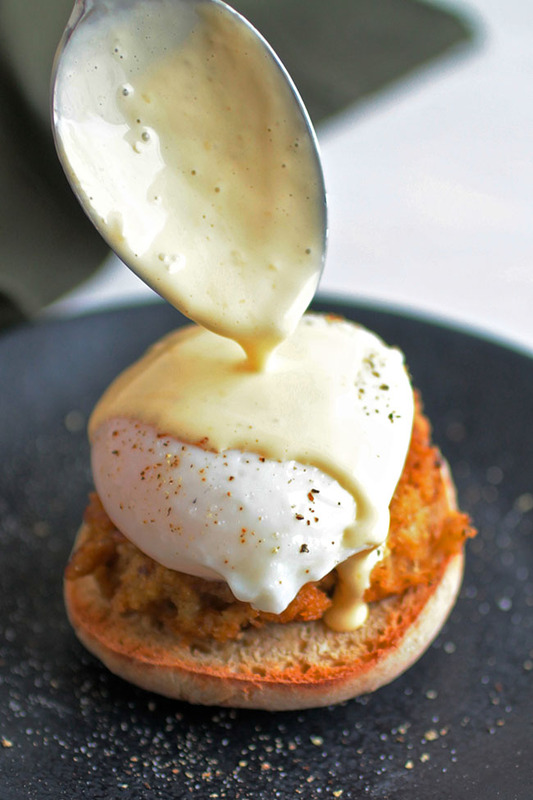 This easy crab cake eggs Benedict recipe is perfect for your next brunch! 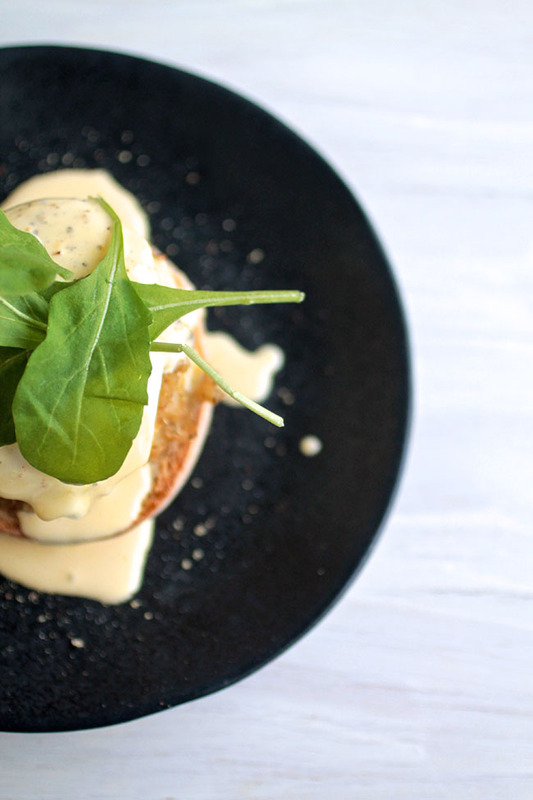 With a foolproof one-minute homemade hollandaise sauce. I’m going through a phase, you guys. A phase where I have an uncontrollable need to poach things. Actually, it’s more of a phase where I have to put an egg on top of EV.ER.Y.THING., but lately I’ve been really truly desperate for those egg-toppers to be of the poached variety. There’s something so satisfying about cutting into a perfect little white pillow and seeing all that gooey egg goodness come pouring out. GAH. I love it. Side note: this is my second breakfast recipe in two weeks. I think that’s some kind of record, seeing as I’m not all that big on breakfast. I guess something about a rich, creamy hollandaise on top of crab cakes on top of BREAD just speaks to me. I keep seeing crab cake eggs Benedict on restaurant menus, but they all use a crabcake INSTEAD of an English muffin, which I kind of hate. If you take away the warm, toasted English muffin, all you have is soft hollandaise on top of a soft egg on top of soft crab. Not a lot of texture there, which, um, is super boring. I find the toasty bits of eggs Benedict 100% necessary, so I decided to whip up my own version and jazz it up a little. I added a toasted English muffin (of course) and some fresh, crisp arugula on top to add a little more texture to break up the softness of the other components. Pro tip: toast the English muffins RIGHT before you assemble and serve, so that they don’t have a chance to dry out and get tough. No one likes a tough muffin. I’ll admit, I was a little nervous about homemade hollandaise when I tried it for the first time. But I found this great tutorial, made a few recipe tweaks to suit my own taste, spent a quality thirty seconds with my immersion blender, and BAM! It’s deceptively easy and the results are totally worth it. 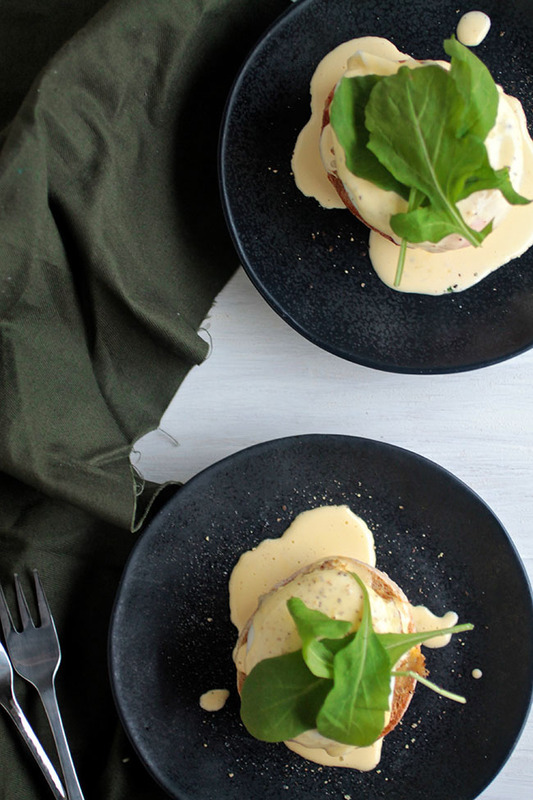 The only real “cooking” you have to do to make this eggs benny is whip the hollandaise together and poach the eggs – super simple, right? PS – I know you probably hear a lot of people laud crab cake eggs benedict as this super-schmancy, only-at-restaurants, only-for-fabulous-people-who-brunch kinda deal. But I call SHENANIGANS on those people, because this homemade version is quick and easy and delicious – and it’s ready in 20 minutes. Also, I am basically never a fabulous brunch-er (shower and put pants on and leave my house early in the morning on a weekend? That’s a funny joke), so I love that this homemade version is sweatpants-friendly. Pair it with a mimosa (or five) for the true brunch experience, then eat it while you sit on the couch and high-five yourself for being awesome. 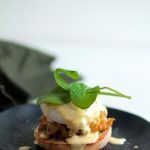 A quick and delicious crab cake eggs Benedict recipe perfect for brunch! Blend the egg mixture with the immersion blender until egg yolks have slightly lightened in color, about 1 minute. Stream hot butter into eggs a little at a time while you run the immersion blender, letting the hot butter cook the eggs and blending until hollandaise is light and fluffy and all butter has been incorporated. If the hollandaise gets too thick, blend in a few teaspoons of water to loosen it before serving. Reheat crabcakes in a hot skillet until the sides are crispy and crab cake has heated through. If you’re using lump crab instead of leftover crabcakes, give it a toss in a hot skillet just until it’s warmed through (or, if you like, leave it cold so you have some contrasting temperatures in the dish!) Set crab aside. Poach each egg in hot water (water should be just-barely-simmering for best results) until whites have cooked through, about 4 minutes. While eggs are poaching, toast your English muffin halves. Place each toasted half of English muffin cut-side up on a plate and top each half with a crabcake (or lump crab mix). When eggs are done, gently place one egg on top of each muffin/crabcake stack and season eggs with a bit of salt and pepper. 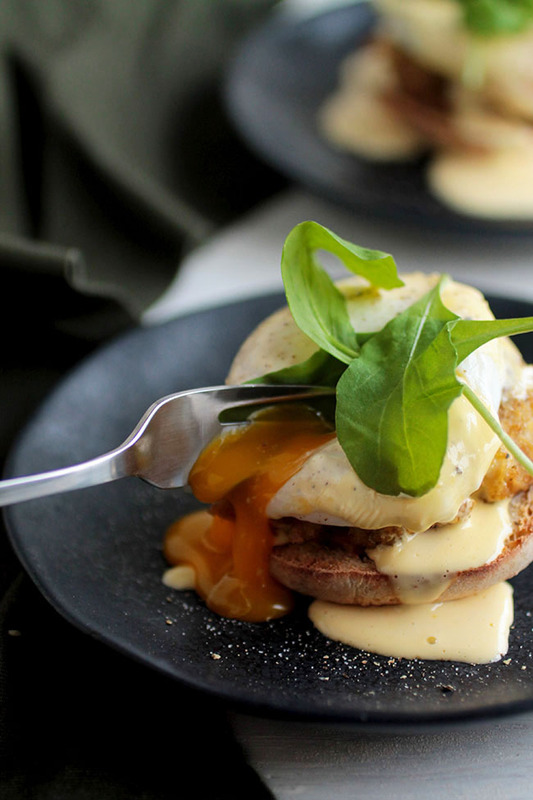 Pour hollandaise over the English muffin stacks. Top with a pinch of fresh ground black pepper and a few fresh arugula leaves and serve immediately. Use leftover biscuits (I like these vegan biscuits or simple gruyere biscuits) in place of the English muffins if you like. Hollandaise recipe adapted from Serious Eats. Oh heavens!!!! This is my new favourite food blog! Just found this recipe. I have been making Crab Eggs Benedict for years. 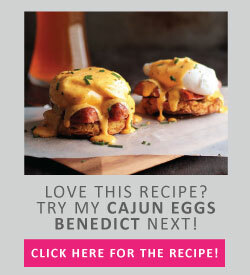 This is the easiest recipe I have ever seen for the Hollandaise sauce. Thanks so much. Just made this for dinner and I’m in love. 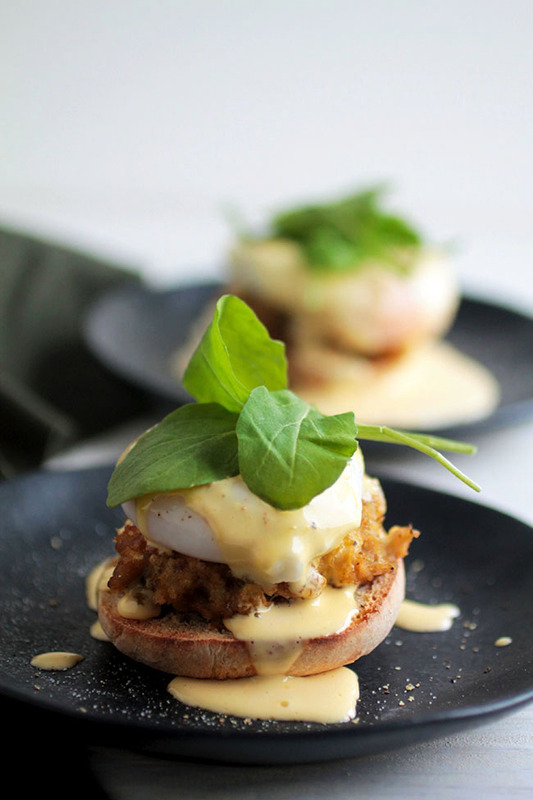 I so wish I had one of these crabcake eggs benedicts for breakfast this morning.. they look so delicious. 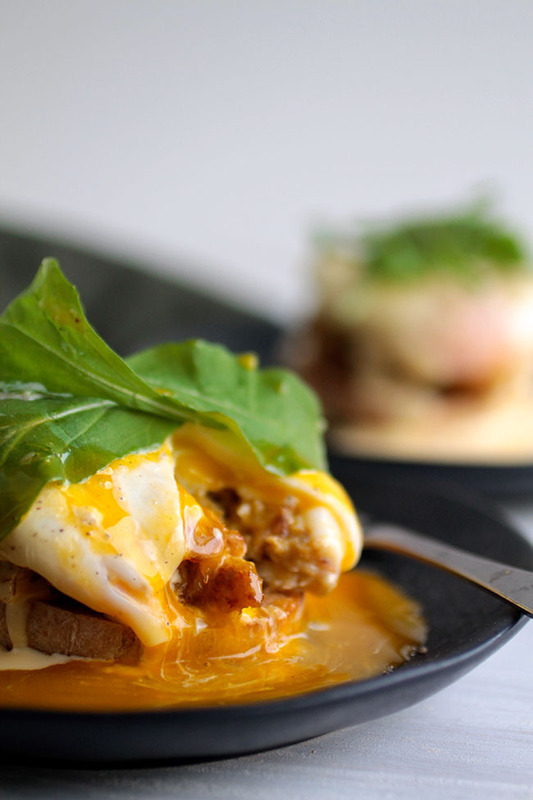 I am a massive fan of poached eggs and make them most mornings so this recipe is a must make for me! Thanks, Thalia! I have been obsessed with poached eggs lately – I’m putting them on everything (and it’s awesome)! I love breakfast, so this definitely speaks to me, Jessie! I also think a good english muffin is 100% necessary. Pinned! Thanks, Kimberly! English muffins are totally the most important part. Thanks! I think it’s my new favorite breakfast! My favorite breakfast meal, paired with one of my favorite seafood dishes. Looks like perfection! Well, now I’m hungry. Delicious post!